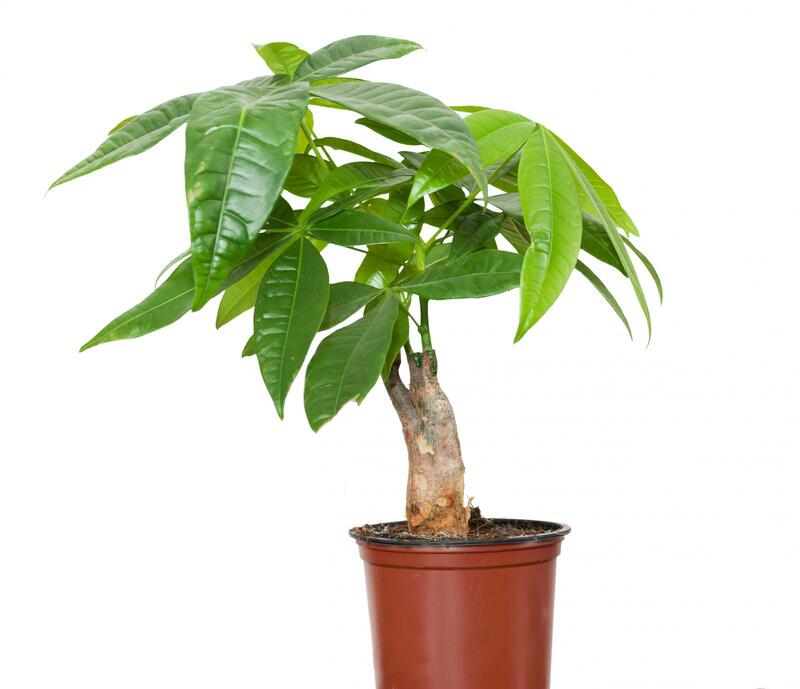 A feng Shui money tree is a symbol used as a cure in appropriate areas to stimulate the flow of money. Several different types of natural trees and decorative sculptures may be referred to as a money tree. Though people use several different types of plants plants as money trees, the pachira plant is the original Chinese plant called the money tree. Some believe it's the shape of the pachira leaves that elevates it to the status of tree that can attract money. The leaves symbolize the five feng shui elements of wood, water, fire, metal, and earth. Because the pachira plant represents the five elements, it's an ideal living example of harmony and balance for those elements. This in turn makes the plant a perfect candidate for attracting money by placing it inside your home to balance the chi energies governing your finances. Many honor the pachira as a plant that attracts wealth and brings great prosperity into the home. This plant can grow up to three feet wide and over seven feet high, so your room will need to be large enough to accommodate the plant as it grows unless you choose a bonsai (pronounced bone-sigh) plant. A popular way of growing a pachira plant is to create a bonsai plant from several plants. Creators make a pachira bonsai arrangement by using five to eight pachira plants and weaving or braiding the stems similar to how a lucky bamboo plant is grown. One such braid style is the golden cage. Traditionally, the golden cage is made up of eight stems (eight is an auspicious number in feng shui) braided together in a cage design. This design symbolizes a cage that collects the money (symbolized by the leaves). Many websites and written material advising about the use of money trees often reference the plants' round leaves. This can be confusing since the pachira leaves aren't round, but are oval. The main criteria for using a plant as a money drawing element is to avoid using spindly or sharp-pointed leaves. These create poison arrows. If you don't have a green thumb or are unable to have live plants for some reason, you can still have a money plant. While not as traditional as the pachira plant, people have used gem, jade, and actual coin trees, for centuries. Other names for a jade plant are money plant, lucky plant, and friendship tree. The jade plant is a succulent plant found in South Africa and many use it as a houseplant. 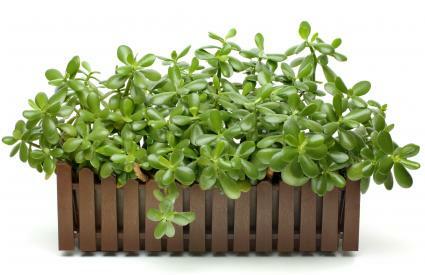 An evergreen plant, the jade plant is a typical succulent with thick stems and round, fleshy leaves. Many bonsai plants are made from jade plants. There is another kind of jade tree that is made from the gemstone, jade. 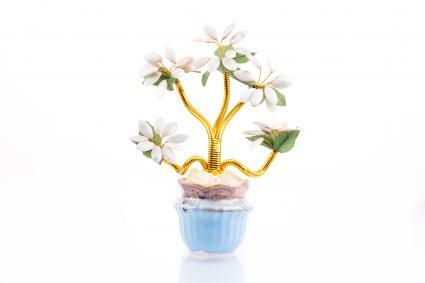 This decorative ceramic tree is comprised of delicately carved pieces of jade or other crystals that resemble rounded and elongated leaves. People consider jade a lucky gemstone, and it is associated with wealth, so it makes an excellent choice for this kind of use. People use other gemstones such a citrine in creating these decorative pieces. These trees are often decorated with coins. Eight and nine coins are the most popular choice of number of coins used. Yet another kind of coin tree used is literally one comprised of coins. This creation is more of a type of sculpture and can be designed many ways. Red ribbon bases and ribbons are often used in this type of design. Now that you've decided which type of tree you want to buy, you're ready to find a place to put it. You may have noticed these plants near cash registers. This is a common practice. If you keep money in your home, then this is an ideal place to set one of these plants. Many people believe that the southeast corner of your home is the best place for this kind of element to attract money. Others feel any area of your home that you wish to bring more prosperity and wealth energy is an ideal place. Feng shui practitioners and enthusiasts use bagua maps to help find the most advantageous areas for placing your tree. Flying star reports also help you determine areas of your home that could benefit from the addition of a feng shui money tree.